Earth system models simulate Northern Hemisphere greening. Figure shows the spatial distribution of leaf area index trends (m2/m2/30yr) in the growing season (April–October) during the period of 1982–2011 in the mean of satellite observations (top), Earth system model (ESM) simulations with natural forcings alone (lower left) and ESM simulations with combined anthropogenic and natural forcings (lower right). OAK RIDGE, Tenn., June 29, 2016 – A multinational team led by the Department of Energy’s Oak Ridge National Laboratory Climate Change Science Institute has found the first positive correlation between human activity and enhanced vegetation growth. “This is the first clear evidence of a discernible human fingerprint on physiological vegetation changes at the continental scale,” Mao said. With the absence of long-term observational records and suitable Earth system model (ESM) simulations, the human “touch” on northern latitude greening had not been previously identified. 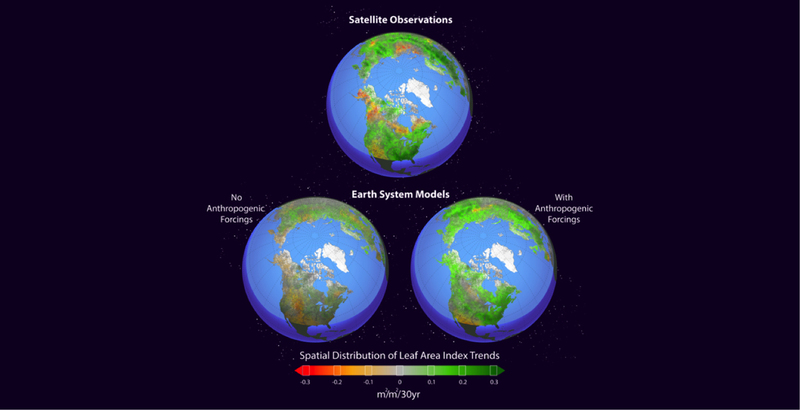 The team used two recently available 30-year-long leaf area index data sets, 19 ESM simulations and a formal “detection and attribution” statistical algorithm to positively attribute changes in vegetation activity in the extratropical Northern Hemisphere to anthropogenic forcings, or human-induced climate inputs such as well-mixed greenhouse gas emissions. Leaf area index – the ratio of leaf surface area to ground area – is an indicator of vegetation growth and productivity derived from satellite imaging. The remote-sensing-based LAI datasets and ESM simulations showed a significant “greening” trend over the northern extratropical latitudes vegetated area between 1982 and 2011, indicating increased vegetative productivity. The study and its results are reported in the article “Human-induced greening of the northern extratropical land surface” in Nature Climate Change. Other ORNL participants and coauthors were Xiaoying Shi, Peter Thornton, Dan Ricciuto and Forrest Hoffman. This study was supported by the DOE Office of Science.